I've been on a 100% raw diet since 2007, and during that time I've lived with roommates who've spent thousands of dollars outfitting their raw kitchens with all the latest gizmos. But I also spent several years wandering around Southeast Asia with only a good cutting knife, a fork, and a spoon to do all my food preparation. Both approaches worked, but there's no question that a few select appliances and tools make eating a healthy raw food diet easier and more enjoyable, and vastly decrease food preparation time. In this article I'm going to outline the tools that I've found most useful for eating a raw diet. First, I'll mention the ones I consider to be must haves, and then go on to describe several more that are nice additions if you've got the inclination to get fancy. These are products I own which I consider to be must haves for a well-stocked raw food kitchen capable of producing healthy food and water. Although I like these models in particular, for some of the items you could probably find comparable products that serve the same functions from different manufacturers. My preference is for cheap when cheap works as well as expensive, but I rather have more expensive items that last and do the job dramatically better than the cheap alternative when that option is a possibility. The Kuhn Rikon Nonstick Paring Knife is by far the best knife I've ever owned, and easily the equal of the high-priced knives I've tried. It's surprisingly sharp, and capable of slicing through just about anything. It's easy to shave the pith and seeds right off a quartered orange without creating a mess, for instance. The awesome carrying case also means you can easily throw it in a backpack or cooler and not worry about impaling yourself or cutting your food bag to pieces. It's really nice to have a great knife for your kitchen that you can also easily take to the beach or out for a picnic in the park. Melons are a staple in my diet for much of the year, and I use the Kuhn Rikon Watermelon Knife to cut them up. This knife easily chops a watermelon into pieces, or shaves the rind right off. I also use it for cantaloupe, honeydews, other types of melons, summer and winter squash, and pumpkins like the kabotcha, which are excellent for spiralizing into raw noodles. While I use the above paring knife for all my small, more precise chopping and slicing, this knife is what I use when I've got a bigger piece of produce to deal with. The convenient blade sheath also allows you to tote it to a Fourth of July party alongside some watermelons without worrying about getting cut. It's also a lot cheaper than comparable blades of the same quality. The most expensive must-have item for any raw food kitchen is going to be a good blender. My top-tier preference is the Vitamix. 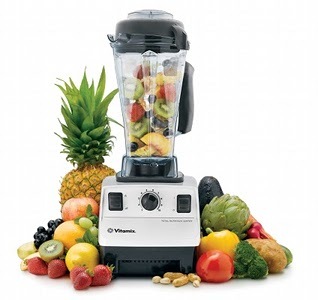 Now you can certainly go buy a $30 blender at Walmart that can liquefy a banana or two, but if you're a raw foodist, your blender is the appliance you'll likely use the most, and you'll want something of high quality. There's nothing more annoying than when your blender is jammed up because it's not powerful enough to cut through a large volume of food, or when there's no tamper to push the food into the blade so you have to pause, turn it off, take the cover off, and manually shove things into the blade with a knife. My Vitamix has never jammed up, and has proven far superior to the Blendtec and Ninja blenders which some of my friends own. I've had my Vitamix since 2008, and although it costs a pretty penny, it's a purchase I don't regret in the slightest. I or those I left it with when I was in Asia have used it at least once a day since then to make smoothies, raw soups, and awesome salad dressings and sauces. It still runs perfectly. Its seven or five year warrantee (depending on your model choice) also means that you don't have to worry about it dying on you anytime soon. My suggestion is to buy a factory reconditioned model and save some money. You can get one with free shipping by entering code: 06-003451 at checkout. When you're on the go, having a nice, portable set of reusable utensils can be convenient.. This spoon, fork, knife, and pair of chopsticks are made from solid bamboo, and fit into the included well-made travel case with a carabiner clip. Since I find that once you stop using metal utensils for a few months and then start again you can taste a tinge of metal with every bite, I prefer the clean taste of wood. I tend to have these in my messenger bag or the glove compartment of my car when I'm out around town. My sole complaint is that the bamboo knife isn't going to cut it when it comes to slicing up fruit, but, realistically, we're talking about wood here, not metal. This is why it's convenient to have the Kuhn Rikon paring knife with its sheath, which I mentioned above. These island bamboo forks make nice flatware to eat your evening salad with. The bamboo ensures that you don't get the metallic taste metal flatware generally imparts. Most municipal tap water systems in the United States test positive for trace amounts of dozens of prescription drugs, and contain number of chemical additives like fluoride and chlorine, which have been linked to all manner of health problems. To get rid of all the undesirable elements and leave yourself with water that tastes fantastic, distillation is your best bet. If you drink nothing but distilled water for a month and then try municipal water again, you'll be shocked by how bad your tap water tastes. The Megahome Water Distiller is among the cheapest on the market, but also one of the best. Mine has been going strong for years, and can distill a gallon of water every five and a half to six hours. The Progressive Adjustable Mandoline is light, easy to clean, and you can adjust the thickness of your slice by simply pushing a button up or down. I find it cuts salad processing time down dramatically over simply chopping with a knife. While specialized, more expensive, and bulkier tools like the spiralizer listed below can do some impressive and fun things with vegetables, like turning a cucumber into noodles, the mandoline can -in a fraction of the time - turn out nice thin slices which are almost as good. While I'm simply too lazy to spend the time required to make noodles with any regularity, I'm happy to use a mandoline multiple times a week to slice things up for my evening salad. You simply drag a zucchini (or virtually anything else) across the board in rapid strokes and it practically falls apart into perfect-sized pieces. Because peels and skins are often coated in food-grade wax, and sometimes are simply too thick or rough to be enjoyable, I find myself peeling vegetables frequently, particularly cucumbers, zucchini, and beets. Although there are certainly a number good options when it comes to peelers, I've enjoyed using this OXO model. I've never owned a dehydrator, and don't think dehydrated food should play more than a small role in any raw foodist's diet. But when you do decide you want some, using partially-dehydrated produce you've made yourself can be a nice treat. I enjoy including things like partially-dehydrated tomatoes or mangoes in otherwise completely-hydrated sauce and dressing recipes to add a concentrated punch of flavor. These are superior to the often-preservative-covered-and-unfresh dehydrated foods you find at stores. Several friends and roommates I've stayed with have owned various dehydrator models, and I've had fun using them on occasion. I've used several of the cheaper circular models, but found they didn't work that well. The best ones I've tried have been the Excalibur models. If you're making food for just a few people, the lower-priced five-tray model will offer you enough space. If you make food for multiple people or are a chef, the 9-tray model is what you want. I've used the later for making raw food meals for large parties, and it came in handy. I grew up in an Italian family eating tons of pasta, and I sometimes miss the tastes and textures involved. I've long made amazing raw Italian tomato sauce, and you can certainly add that to salads, but having a pasta substitute that doesn't leave you feeling horrible like real pasta can be nice. That's where a spiralizer comes in. Simply peel up some cucumbers or zucchini, put them through the spiralizer, and you've got something with a taste, texture, and eating experience that's very close to real pasta. I'd much rather eat a good raw spiralized pasta and sauce than the real thing because it leaves you feeling light and unburdened by a heavy stomach. The model I own and suggest is the Paderno World Cuisine Spiralizer, which includes several inserts to create different-sized pastas. I don't own a juicer, but I've tried a number of different models over the years. Personally, I prefer to eat whole fruits and vegetables, but juice can be a nice occasional treat on a raw diet. People frequently ask me about making fresh raw orange juice, and I agree that it tastes wonderful if you use good citrus. One model which is simple and easy to clean is the Citistar Juicer by Tribest. It's nothing fancy, but it gets the job done and produces good juice with minimal hassle. Learn how to eat a healthy raw food diet with all these tools. Figure out what rawfoods are healthy, and which are harmful. After you've set up your raw food kitchen, get started on a diet that will help you lose weight and feel amazing.